In 1889 Munch started spending periods of time at the resort of Åsgårdstrand, which was popular with artists and writers. While summering there in 1893, he developed the pictorial ideas that some years later would evolve into Girls on the Pier. His first version of the composition (National Gallery, Oslo) dates from about 1901 and the Kimbell’s from about three years later. 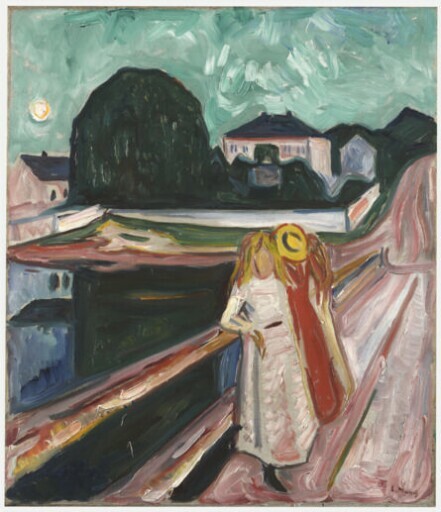 Following the lead of modern artists such as Monet and Renoir, who in the early 1890s began to play multiple variations on a single compositional idea, Munch painted seven versions of Girls on the Pier between 1901 and 1930, as well as half a dozen closely related works with groups of older female figures in the same setting. In all these, Munch depicted the pier with slanting lines receding dramatically into the background space. Among the Girls on the Pier variations, the Kimbell’s is one of the most freely painted. Exaggerating line and color to create haunting, even ominous, moods, Munch portrays a world charged with anxiety. It is the setting, rather than the girls’ poses and expressions, that suggests they may be brooding about their identities or desires. They appear absorbed, like the painter, in their observations of the water, the pier, and the nearby Grand Hotel under a full moon. The nearest girl turns away from her friends toward the viewer but her face is blank, an emotional riddle.